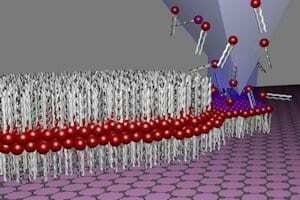 Graphene emerges as a versatile new surface to assemble model cell membranes mimicking those in the human body, with potential for applications in sensors for understanding biological processes, disease detection and drug screening. Writing in Nature Communications, researchers at The University of Manchester led by Dr Aravind Vijayaraghavan, and Dr Michael Hirtz at the Karlsruhe Institute of Technology (KIT), have demonstrated that membranes can be directly ‘written’ on to a graphene surface using a technique known as Lipid Dip-Pen Nanolithography (L-DPN). The human body contains 100 trillion cells, each of which is enveloped in a cell membrane which is essentially a phospholipid bi-layer membrane. These cell membranes have a plethora of proteins, ion channels and other molecules embedded in them, each performing vital functions. It is essential, therefore, to study and understand these systems, thereby enabling their application in areas such as bio-sensing, bio-catalysis and drug-delivery. Considering that it is difficult to accomplish this by studying live cells inside the human body, scientists have developed model cell membranes on surfaces outside the body, to study the systems and processes under more convenient and accessible conditions. Dr Vijayaraghavan’s team at Manchester and their collaborators at KIT have shown that graphene is an exciting new surface on which to assemble these model membranes, and brings many advantages compared to existing surfaces. Dr Vijayaraghavan said: “Firstly, the lipids spread uniformly on graphene to form high-quality membranes. Graphene has unique electronic properties; it is a semi-metal with tuneable conductivity. April 4, 2019 - New wearable skin biosensors to aid wound healing Medical Device NetworkResearchers from Binghamton University have developed new wearable biosensors to help in wound healing process by imitating skin. March 28, 2019 - Implantable Glutamate Biosensor Could Monitor Effectiveness of Drugs for Neurotrauma Genetic Engineering & Biotechnology NewsImplant to better track brain chemical gone rogue after neurotrauma. April 2, 2019 - Wearable biosensors help wound healing process by imitating skin Business StandardResearchers have developed biosensors that are structured similarly to that of the skin's microarchitecture and helps in the process of wound healing. April 4, 2019 - How synthetic biology could fight athletic doping with 'biosensors' Genetic Literacy ProjectIt's no secret that sports suffer from doping, the use of banned substances that enhance athletic performance. From Lance Armstrong being stripped of his. April 16, 2019 - 2019 Innovations in Biosensors, Atom Dynamics, 3D Printing, Omniphobic Surfaces, Tissue Scaffolds, Nanoplastics, Hydrogel, Photoelectrochemical Cells, and Sodium-ion Batteries - ResearchAndMarkets.com Associated PressPress release *content* from Business Wire. The AP news staff was not involved in its creation.